During our three-month European adventure, we mostly lived in vacation rental apartments through France, Switzerland, and Italy. Even on shorter trips, I enjoy having an apartment for a bit more space, a more local feeling, and the ability to cook some of my own meals. It's one of my favorite ways to travel like a local. When hunting for a vacation rental apartment in Paris, I have one major piece of criteria: wherever I stay must have those tall, Pinterest-worthy Parisian windows that open out to a lovely view or private balcony. After searching everywhere from Airbnb to Paris Perfect, I've collected ten of the prettiest apartments you can rent in Paris. 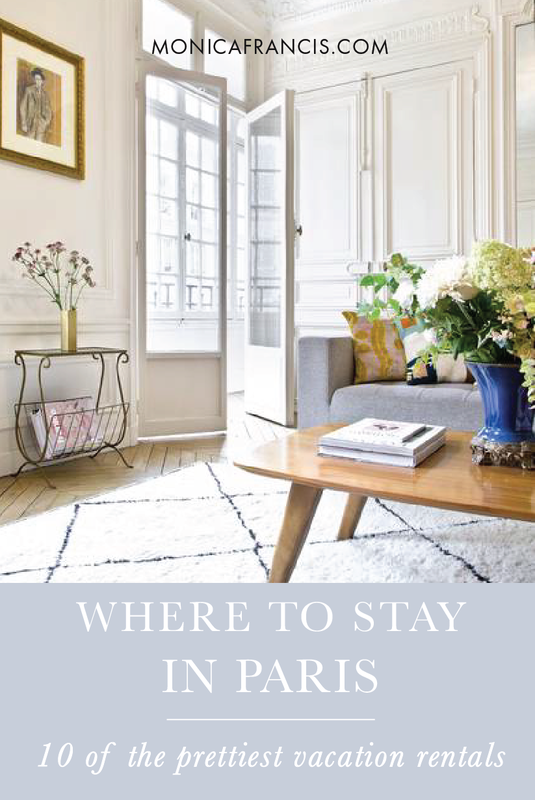 From a flat with a private terrace in Saint-Germain-des-Prés to picture-perfect clawfoot baths, each place on this list has those beautiful windows and plenty of style besides. 1. Cozy Pied-à-Terre in Le Marais, from $160 per night. This one-bedroom flat is a wonderful combination of value, location, and classic Parisian architecture. On the edge of Le Marais, you'll be able to walk almost anywhere in Paris, especially the Right Bank and of course the 3rd and 4th Arrondissements. The apartment has plenty of five-star reviews, and is located right near one of my favorite streets on this side of the river, Rue Montorgueil. 2. Stylish Flat in St. Germain, from $245 per night. This renovated one-bedroom apartment by OneFineStay has plenty of classic style with colorful details - take a look at that pink-and-gold armchair in the bedroom! Between the residential Left Bank location and the beautiful kitchen, you'll find that more local feeling while still being able to walk to some of the best museums and restaurants in Paris. 3. Luxury Stay in Le Marais, from $400 per night. In the heart of Le Marais, this one-bedroom flat has just about everything you would expect from a luxury hotel: plenty of space, beautifully furnished, and a fantastic location - even if you're not currently planning a trip to Paris it's worth a click through to see the incredible style of this place. The living room has a sofa bed, which means you could sleep up to four guests here. Right near the Musée Picasso and many of my other favorite places to eat and shop in the 3rd & 4th, the location is so walkable you might forget that it's also very convenient to the metro. 4. 'Rare Jewel' in Saint Germain, from $380 per night. 'Rare Jewel' is not exaggeration: this two-bedroom flat in Saint-Germain-des-Prés boasts an indoor fireplace and a beautiful private terrace. The location is also wonderful, within easy walking distance to pretty much every classic Left Bank spot and convenient access to the metro if you don't want to make the longer walk to the Eiffel Tower or the Right Bank. It's no surprise that this place gets booked up months in advance, often by repeat visitors that leave glowing reviews. 5. Spacious & Modern in the 7th, from $650 per night. With three bedrooms and an Eiffel Tower view from the balcony, this spacious flat is perfect if you're traveling with family or friends. You're just steps away from the Champ de Mars and near one of my favorite market streets, Rue Cler - it would almost be a crime not to pick up a Parisian picnic for a sunny afternoon or under the sparkling tower at night. Take in some of the best views of the city from Pont de l'Alma, and be sure to visit the beautiful Musée Rodin. 6. Perfect Views on Île St-Louis, from $240 per night. In my experience, apartment rental services in Paris tend to each have their own area of expertise and at Guest Apartment Services, it's charming little Île Saint-Louis. On our most recent trip to Paris we split our stay between one of their flats and the boutique Hôtel Caron de Beaumarchais, and loved our experience. The 'Mimosa' studio apartment offers not only those dreamy Parisian windows, but perfect river views - and you're very centrally located, dangerously close to the best ice cream at Berthillon. 7. Romantic flat in the 7th from $475 per night. Eiffel Tower views are the speciality at Paris Perfect apartments, and this one is a bit famous. You've probably seen this photo on Pinterest or Instagram, taken from the clawfoot tub in this one-bedroom flat with the sparkling tower right outside the window. With an open kitchen and private balcony, you might find yourself taking every meal at 'home'. When you're not drinking champagne and gazing at the view, you can easily explore the Left Bank and the rest of central Paris - there are so many things to do! 8. Elegant Style in Le Marais, from $490 per night. This two-bedroom flat is the kind of place that you'll never want to leave - from the architectural details and beautiful light to the artful home décor, there's plenty to love. Its location in the Haut Marais is near many stylish shops and restaurants, and just minutes from the famous Enfants Rouges market. You can easily explore the 3rd & 4th, as well as some of the outer arrondissements, and there's easy access to the metro to see the rest of the city. Now if only the host, Frank, would tell me where he finds those vintage teacups! 9. Kid-Friendly pied-à-terre, from $500 per night. One of the three bedrooms in this spacious flat is a dedicated childrens' room, which is quite a find for short-term rentals in the city. Located in Saint-Germain-des-Prés between Musée D'Orsay and Musée Rodin, the area is highly walkable and a great home base if you'll need to stop back at the apartment during the day. There's also a full kitchen and two bathrooms, not to mention the postcard-ready street views and ornate details throughout the flat. 10. Peaceful Flat in Le Marais, from $280 per night. This luxury one-bedroom apartment is just around the corner from Place de Vosges, one of my favorite places to spend a morning in Le Marais. There's also plenty of chic shopping and dining here, but the garden view keeps this flat quiet among the buzz of the neighborhood. You're also just a few minutes from the charming neighborhood Saint-Paul and its hidden courtyard village - read more about it here.